"An unbiased capturing of emotions, the City of Joy and a well-crafted thriller with a very shocking conclusion"
From now on, I will watch any movie that has the name 'Vidya Balan' in it. There is so much, so much in her to give as an actress, that every last role of hers seems to be the limit of her talent. You will actually 'discover' expressions and will feel so contented when she leaves the screen. And that was not the only best thing about Kahaani. The ensemble cast has a great combination of new faces (new for rest of the world, not for the Bengali viewers) and known ones.Every character seems to be there for a purpose-even that little boy in Monalisa Guest House-- enough said. Parambrata Chattopadhyay aka 'Topshe' (as the Satyajit Roy's Feluda patrons would know him) plays his part really well, with the innocence as required, in a policeman new to his job. Saswato Chatterjee as the ___ oh wait I cannot reveal his identity, yes as the essential character, was splendid, which you will see in many scenes like the Metro scene shown in the trailers. And the rest of the cast was largely composed of local artists from Bengali entertainment industry-all were doing just what they required to do-no exaggeration, just the right thing. Don't worry, none of the above instances were spoilers. The background score helped connect the viewers to the scenes well. Apart from 'Ekla Chalo Re' and 'Aami Shotti Bolchi' no other track was played between the movie. The intentions of the director was clear-he wanted the viewers not to drift away from the plot at all. And he was successful. Director Sujoy Ghosh- whatever I say would fall short for his work. Apart from all the skillful framing and setup, one thing I truly enjoyed was- he made us believe during the intermission that this would be another cliché-and thus, what actually happened in the end felt more shocking because of this very belief he formed in our minds. Fantastic. The portrayal of Kolkata could not have been better than this-it was unbiased and accurate. Being a bengali himself, the director did not intend to 'glorify' his city. This is what was needed from him. Also, pulling off smaller marvels like amalgamating the intermission between the Metro Rail scene, the climax being put within the Dashami celebrations was appreciable. Crafty use of the moments of the city I must say. The end note by Amitabh Bachchan dilutes the shock you will get in the climax, to a beautiful satisfaction. 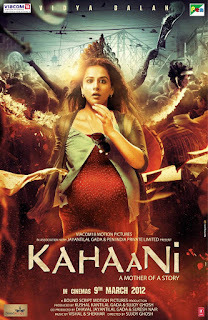 Kahaani. Truly, a mother of a story. Do not miss it.